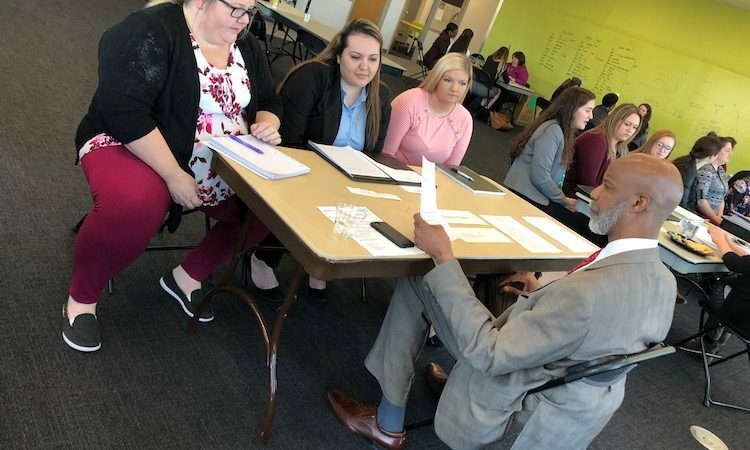 Master’s in Social Work students from the University of Indianapolis participated in a mock interview event as part of their field seminar course. The event, organized by seminar coordinators Lainey Collins and Melissa Ketner, included rounds of practice interviews and resume reviews. Ten interviewers attended the event, including faculty from the Phylis Lan Lin Department of Social Work and external field instructors who volunteered their time. In a format similar to speed networking, students rotated from table to table to answer interview questions, observe other students answering questions and get feedback on resumes from interviewers. The interview questions developed for the event were intended to be representative of questions that would be asked in a social work job interview. Prior to the event, students also submitted interview questions they were nervous about or wanted to practice in preparation for interviews. All of the interviewers came to the event with unique and diverse social work practice backgrounds, allowing students to receive valuable feedback from a variety of sources. While some students found themselves nervous before beginning the practice interview rounds, they quickly became comfortable and began to enjoy the experience. Students said they left the event feeling more confident in themselves, their interview skills, and in their ability to land a social work job. Considering this was the first mock interview event held by the social work program, all involved were pleased with the outcome. Plans are in the works to incorporate this activity for graduating students each semester.